Ruthie Foster makes my heart skip a beat every time she opens her mouth and perfection comes rolling out. Most people who know me well know that Blues is my ULTIMATE genre of music. When I started DJing back in 2001, I was a blues DJ. 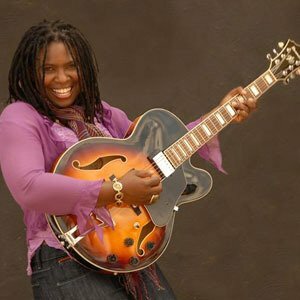 Ruthie Foster was an artist I had played often during my blues sets and was more than happy to introduce her music to as many people as I could. I hope this post spreads this Blues woman’s music to more people. This woman can BURN UP a stage when she takes it over, much like Deborah Coleman, Bonnie Rait, and Sue Foley. Coming from a humble church beginning in Texas, Ms. Foster served in the US Navy, and has since won many well-deserved awards, including the Koko Taylor Award for Traditional Blues Female Artist of the Year 2011, 2012 and 2013. If you are enjoying what you hear and would like to pick up her CDs, you can hit up her official website music page to select your purchase options. A great artist right there! Her music and voice is beautiful! I’m neither into blues, nor into female singers, but even I have to admit she has a beautiful voice.